I'm so excited! And I just can't hide it! Okay, enough 70's (80's?) music! I was lucky enough to be the Unity Stamps Growing in Unity Girl a few months ago, and now they have asked the participants from the last two months to come together for a blog hop! Woohoo! We were given this week's Stamp of the Week to use. It's called, Need a Squeeze. It's super adorable! It's one of the Itty Bitty stamps so it comes with an image and a sentiment. The image has three citrus slices. When I saw one that resembled a lime, the first thing I thought of is MARGARITAS!!! I love me some margaritas! I tried a new technique I've never used before. Actually I've never seen it used before, although I can't imagine with all the talented artists out there that I came up with something original! Ha ha! I cut out a margarita glass with my Silhouette Cameo and then used the negative as a template to cut another glass shape out of plastic, I colored the plastic with my Bic Mark-It's making sure to leave it looking a little streaky so that it would resemble liquid in the glass. Next, I added some Martha Stewart Glitter on the rim of the glass. After all, you can't have a margarita without salt on the rim! 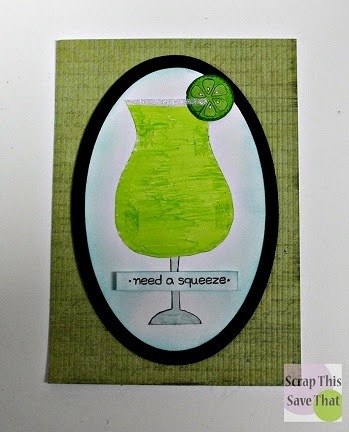 I colored and cut out the little lime to add to the edge of my glass! Next I mounted the plastic piece to a white oval background that had been edged with Tim Holtz Distress Ink in Peacock Feathers. That was all mounted on black and then some DCWV cardstock. I popped up the little sentiment across the bass of the glass, and called my card complete! Please hop along with us! I'm including the whole list of participants so you can start at the beginning and see all the gorgeous works of art! Thanks so much for hanging out with us! Have an INCREDIBLE Memorial Day Weekend!! Yes, we need salt on my margarita..lol! Love how you chose to use the citrus! And the glass cut out is wonderful, great using your Silhouette. This would be a fun card to send. Amazing job on making this look like liquid - awesome card! Fun design! Looks yummy, Amy. Cheers! 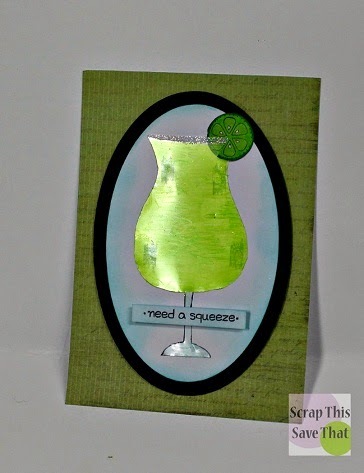 This is one super crafty genius card! Awesome card and margarita! That glass looks mighty refreshing! What a fun technique and great result! Super creative I love it! Great job! I love this technique...I gotta give it a try sometime! Thanks for the inspiration...and now I'm craving a margarita, ha ha! Glad I was in this hop with you! Super fun card! I'd love me a margarita about now! What a great technique! Love your rim of salt! Fabulous card! It really looks like a yummy margarita! Wow, Amy what a clever design. I can almost the taste the delicious salty tang. Great technique and cute sentiment. Where's the salt? Right on the rim of that fabulous margarita you created! LOVE this!! So glad to be part of the hop with you, Amy! Cheers! Very unique!! I can almost feel the cold of that glass!! Love it! So very cute and creative! Way to think outside the box!! !